DUBAI/ADEN, July 6 (Reuters) - Nearly 100 people were killed on Monday in air strikes across Yemen, the Houthi-run state news agency reported, as a Saudi-led coalition stepped up attacks that are likely to weigh on efforts to broker a humanitarian truce. The United Nations has been pushing for a halt to the air strikes and fighting that have killed nearly 3,000 people in Yemen since March when the Saudi-led coalition intervened against the Iranian-backed Houthi forces to try to restore exiled President Abd-Rabbu Mansour Hadi. The Houthi-run Saba news agency said 54 people had been killed in a series of raids in the Amran province, north of the capital Sanaa, including 40 who had been shopping at a market in an area called Lower Joub in the Eyal Yazeed district. It said a number of women and children were among the dead. Saba said Saudi-led war planes had also killed more than 40 people in a raid on a livestock market in the town of al-Foyoush in southern Yemen. Local residents also reported 30 deaths in a raid they said apparently targeted a Houthi checkpoint on the main road between Aden and Lahj. They said 10 of the dead were Houthi fighters. A spokesman for the Saudi-led coalition could not immediately be reached for comment. But a spokesman has previously said the coalition does not target civilians. U.N. special envoy to Yemen Ismail Ould Cheikh Ahmed held talks with officials from the dominant Houthi group to try to broker a ceasefire to allow aid supplies to be delivered. The Yemeni government, exiled in Riyadh, said consultations were being held on implementing an April U.N. resolution calling for the Houthis to quit cities seized since September and for aid supplies to be sent to stricken Yemeni civilians. "We are now in consultations for guarantees to ensure the success of the truce," Hadi spokesman Rajeh Badi told Reuters. "The mechanism we presented to implement (the U.N. resolution) demanded real guarantees to ensure aid is delivered to those who need it," he said, noting that talks were underway to "lift the deliberate siege on Aden, Taiz, Lahj and Dhalea." Major cities in central and southern Yemen have been racked by heavy fighting between the Houthis and a patchwork of military, regional and tribal forces allied with Hadi. Badi said a sought-after "humanitarian pause" would last till the end of the three-day Eid, expected to start on July 17. The Houthis have also signaled readiness to honor a truce. The intensive diplomacy came amid a growing outcry over the deteriorating humanitarian situation after more than three months of air strikes on the impoverished country prompted by the Houthi advance south on an area controlled by Hadi's government. Saudi Arabia sees the Houthis as proxies for arch-rival Iran, which they accuse of trying to expand its influence in Riyadh's immediate backyard. The United Nations last week designated the war in Yemen as a Level 3 humanitarian crisis, its most severe category, and the United States and the European Union have endorsed calls for a humanitarian suspension of hostilities. Residents in Aden said mortar shells fired from areas of the city held by the Houthis on Monday set a gas pipeline and empty oil storage tanks in the al-Buraiqah area on fire. Overnight on Sunday, Saudi-led military planes destroyed the main headquarters of former president Ali Abdullah Saleh's General People's Congress party in Sanaa, residents said. Saleh is an ally of the Houthi group and still enjoys the loyalty of much of the armed forces more than four years after being forced to step down by mass 'Arab Spring' protests. Aid agency Médecins Sans Frontières (MSF) said on Monday medical facilities had received hundreds of people wounded in airstrikes and ground shelling across Yemen in recent days. 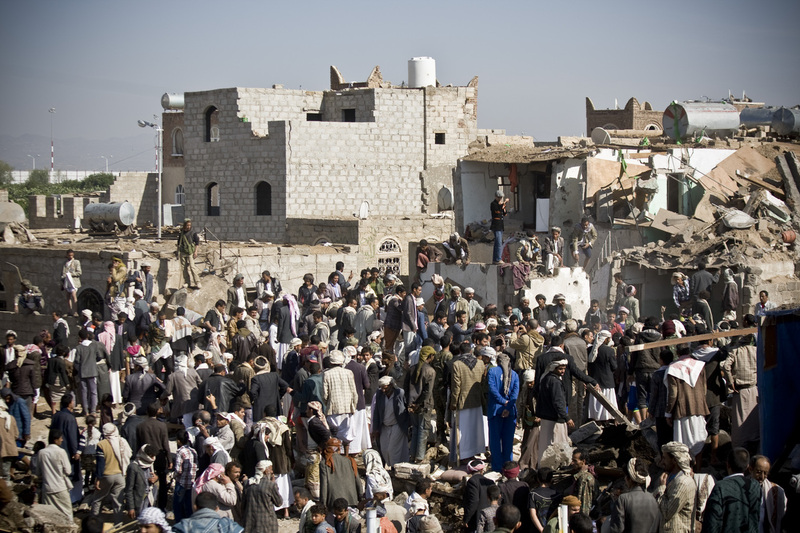 "It is unacceptable that airstrikes take place in highly concentrated civilian areas where people are gathering and going about their daily lives, especially at a time such as Ramadan," said MSF head of mission in Yemen, Colette Gadenne.